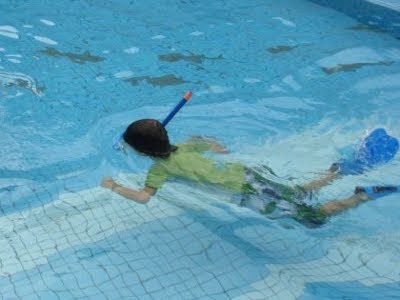 We bought snorkel sets for Aratakara about a month ago. They really like them. Whenever they go down to the swimming pool, they take them. Hopefully we can go to the sea with lots of fish soon. They have wanted to buy roller-blades since they say Aya skating. We went to buy one set yesterday. They've been practising in our flat at the moment. 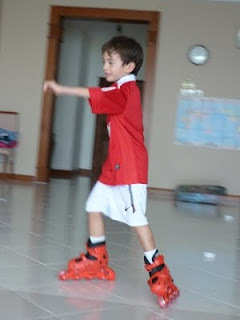 I also took out my old blades, and I spent skating some time today, to go to get tea to the kitchen etc. Aratakara just watched and copied what I was doing, then they've sort of master the basic balancing by the end of the day. Kids learn things very quickly. I really envy them.